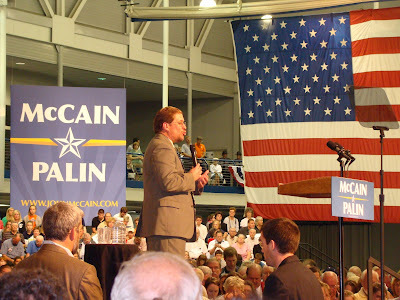 Pastor Scott Distler of the Grace Brethren Church of Lititz, PA, offered the public prayer at the McCain/Palin presidential campaign rally in Lancaster, PA, on Tuesday of this week (Doug Kegarise photo). To read more on the rally, which was held on the campus of Franklin & Marshall College and was attended by about 7,000 enthusiastic fans, click here. You can read Scott’s prayer by clicking here.